The biggest question in CIPP, and likely the most controversial, is its impact on air quality. When resins are heated with steam or hot water, they produce a compound called styrene. Though commonly found in many foods, including coffee and peanuts, styrene in higher concentrations like those found at heat-cured CIPP work sites may have dangerous effects. Currently, the US Environmental Protection Agency (EPA) considers styrene a “known carcinogen.” In addition to styrene, the emissions from manholes, historically referred to as steam, have been found to be a “multi-phase mixture” of volatile organic compounds (VOCs), semivolatile organic compounds (SVOCs), partially cured resin, organic vapors and other particulates. For every worker on a CIPP installation site, regardless of resin makeup or cure method, a respirator is a simple way to limit inhalation of potentially hazardous chemicals. Utilizing a respirator (and blower ventilation when indoors) when working with styrene-producing resin helps protect workers from inhaling potentially hazardous compounds. At heat-cured CIPP installation sites the air quality can vary widely minute-by-minute, depending on meteorological conditions, environmental conditions and worksite activities. In addition, the distance air hazards travel from the job site, along with concentration and reaction with the air has yet to be fully understood. 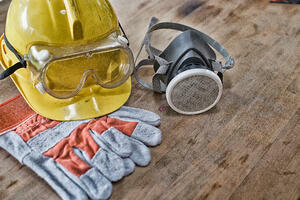 Respirators should be workers’ first line of defense on all steam or hot water-curing jobs. Working with resin also puts workers at risk of skin and airway reactions. Epoxy resins in particular are strong skin irritants. Resin-to-skin contact can result in contact dermatitis, a red, itchy rash. Nitrile gloves and skin barrier cream under standard work gloves can limit the contact your workers have with resin. Epoxy resin also gives off VOCs which can irritate workers’ nose and throat and even cause occupational asthma. Again, a respirator will protect workers from these effects. Chemical exposure is not the only risk. As with any construction site, there’s a danger of equipment failing or workers making common mistakes. At a CIPP installation site, workers can be cut by equipment, burned by water or steam, hit by falling tools, subject to eye injuries from flying debris, struck by passing traffic, fall from trucks or into manholes, sustain temporary or permanent hearing loss, or suffer any number of minor injuries. Ensuring every worker has adequate personal protection equipment (PPE)—hard hat, safety glasses, gloves, steel toe boots, hi-vis clothing and hearing protection—minimizes the risk for these injuries. But, there are other options. First, utilizing a cure monitoring system like PRT’s VeriCure allows workers to stop curing as soon as the liner is complete. The shorter the cure time and the less time workers spend on the job site, the less they may be exposed to these hazards. Another option is to forego steam and hot water cure methods entirely. UV CIPP relies on ultraviolet radiation to cure liners, so there is no vapor or contaminated water to contend with while curing. Using a styrene-free resin with UV CIPP also ensures that surrounding buildings and passersby—who may not have PPE on hand—are not exposed to potential hazards as well. Every construction worker knows that a job site is dangerous. Having the right PPE helps protect workers from those dangers, and choosing risk-reducing technology provides workers with a safer work site from the start.